vicar of Llanstadwell 1873-1911, he was born in london in 1824, the grandson of Lady elizabeth Spencer, daughter of the Duke of Marborough. He studied at Oxford and Brasenose College. The intellectual accomplishments of the man were great, he spoke seven languages, English, French, Dutch, Italian, Spanish German and Chinese and was also interested in heraldy, Navigation, astronomy, mathematics and composing church music. His ministry included periods at Hurworth, Durham, Brent Pelham, Jamaica, Australia and he was also curate of St Saviour's Highbury London. He married Anne Bussell in 1856 and was appointed vicar of Llanstadwell in 1873. He died six weeks after his wife in 1915 and was buried in the churchyard. 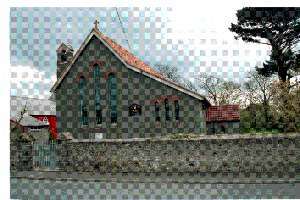 He was instrumental in the building of St Clement's Church Neyland. Saint Clement's churhch is not open daily only during service times on Sunday from 9am untill 11am and Wednesdays 9:40am untill 10:40am, otherwise people have to make contact to obtain entry.